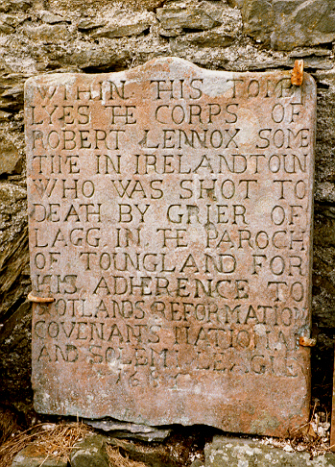 Robert Lennox was one of the Covenanters who was shot at Kirkconnel Moor in 1685 by John Grierson of Lag. He refused to let the bodies be buried there, so once the soldiers had gone, friends took the bodies and buried them in their home parishes. The small headstone to Robert Lennox is located in the old churchyard at Girthon. It is now affixed to the wall of the ruined church. It is likely that the stone was originally carved by Robert Paterson, 'Old Mortality'.